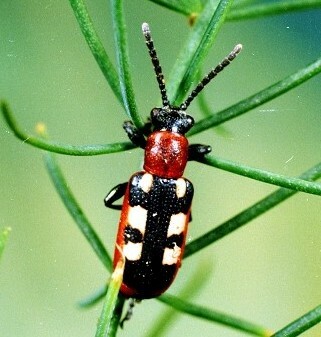 Region: This beetle is found throughout North America. Life cycle: This beetle will produce two to four generations every year. The adults will hibernate in trash left around the garden during the winter and will emerge in early spring to eat the asparagus shoots and lay their eggs. Feeding characteristics: The adult beetles and the beetle larvae chew on the asparagus shoots during the early spring. Physical Description: This beetle is slender and only 1/4 inch in length. It has a metallic blue to black coloring with four white, yellow, or orange spots and reddish outlines on the wing coverings. The thorax is reddish and has two spots, while the head is bluish. The larva is 1/3 inch long, is dark gray to an olive green with black legs and head, and is plump, soft, and wrinkled. The eggs are shiny and dark and are very small specks. The eggs are attached at one end to the asparagus spears. Controls: Since this beetle houses in garden trash, keeping your garden clean may cause the beetle to leave to find shelter. Expose overwintering adults during the winter by turning over the soil around the plants. While the beetle's host plant is asparagus, the pest dislikes tomato plants. Interplanting will drive these beetles away. Nasturtiums and Calendula also discourage the beetle. Chalcid wasps and Lady Beetles give some natural control. You can purchase lady beetles and release them just as the stalks start to grow out of the ground. Bone meal will also serve as a repellent and an organic fertilizer, while dusting your plants with Rock Phosphate is another option. If the infestation becomes serious, then apply rotenone.